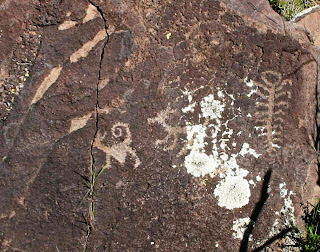 This photo was taken at a prehistoric rock art site in Arizona. It could represent a bobcat or mountain lion (or a coyote). Any guesses? After a day off from trapping I was set to help a lady in the W. Valley to trap 10-12 cats. It seemed like an easy job but unfortunately most of the cats did not cooperate while I was there. This meant a trip back in the morning for the stragglers and then another trip back the next day for one more straggler. This job turned into a four day adventure as they most always do.. I ended up at two vets on Wednesday forgetting again that the vet at one clinic was gone all week and the relief vet was there. When I showed up with nine cats and saw eight cats being unloaded at the first clinic, I know I was in trouble. Fortunately the other vet agreed to take six more cats. I thought all was well but it never seems to be in the feral cat volunteer world. At 4:30 PM I picked up the three cats at the first vet. They were ready but one cat had a bad wound that needed to be cleaned and stitched and the cat would have to stay confined for a week or so and be seen by a vet in a couple of days. I called the second vet to tell them I was on my way and was told they could not get to my six other cats that day. Bummer! So now I had three fixed cats and six cats still waiting to be fixed. The caregiver was trapping again that night herself so all I had to do is feed and water the nine cats in my garage. I left for the far W. Valley before 6:00 AM. I had with me the three cats to be released, the six cats waiting for surgery, and the rabbit cage and supplies for holding the injured cat for a week. Fortunately, the caregiver was able to care for the cat. She had caught one more cat overnight (but not the mother cat of course). I released three cats and headed to the vet with seven cats. This job had yielded a total of ten cats so far. In the afternoon I had an interesting trapping job. I'd planned to take my drop-trap to one of our volunteers so he could catch a cat in his car parts warehouse. This bully was terrorizing another cat they were feeding. The bullied cat recently had to be taken to the vet for a costly surgery. When I arrived, I of course, could not resist trying to round up not only this cat but several other unsterilized male cats living in the warehouse. The cats have free roam of the place and it was quite a sight to see. The cats run up and down the mobile staircases and across the shelves admidst all the spare parts. The tom I was after was amazing! He was long-haired with a lion's mane making his "chuckle head" look even bigger. I scooted around on the floor moving the dropper around the warehouse to no avail. I did manage to ruin a perfectly good pair of shorts in the process (the backside is now are covered with grease and has been religated to the "trapping only" category). Still, it does not get any better than this. I set out early for the W. Valley to released the seven cats and headed to the vet with the one cat. I left the trap at the place where I released the seven cats and the caregiver did manage to catch the mother cat a week or so later and they are now done trapping. So three more colonies are now completely fixed. It is so important that we take the time to finish colonies and that caregivers follow up and fix ALL the cats including ones that show up in the future. The SNH does keep a database of those who are trapping and the number of cats fixed and when, but caregivers need to be vigilant, especially looking for new cats showing up to eat. One unsterilized queen will defeat all efforts ... Oh, I forgot to mention I had to release the three cats back to the warehouse on my way to the vet. Fortunately it was on the way. I released the last mother cat back in the AM. I'd be trapping that night for the monthly clinic in N. Phoenix on 11/15...more on that next week. The Spay Neuter Hotline TNR program has clinics available every day of the week and most Sundays. We fix cats almost every Sunday in Tempe and one Sunday a month in N. Phoenix. We do provide trapping assistance for those needing assistance. This is mostly for large colonies, the elderly and disabled, and those without a vehicle. We also provide financial assistance for those in need. Please spread the word that help is available. These are tough times for many individuals but help is available. The wait may be longer but we do try to help everyone.